We’ve all been there. You’ve got a massive project to complete, and the deadline has crept up on you from nowhere. You’ve known about the deadline for a while, but there’s always been something more important, like that video you were tagged in or that endless debate on Twitter. Now panic has set in. You can’t focus for long enough to get the project done, and it seems like you’re going to miss the cut-off. Okay, breathe. Stay calm. With a bit of organization, you’ll be right back on track. Here’s what you need to do. A cluttered space is a cluttered mind. Although some mess is commonly thought to be a sign of creativity, we’re talking about staying on task here, and having loads of stuff all up in your space isn’t good for focus. Neuroscientists at Princeton University carried out a study that looked at task performance in organized versus cluttered environments. They found that working in a disorganized space results in decreased performance and increased stress. It makes sense. Clutter causes distractions. Challenging yourself to find out how many times you can fold an empty packet of potato chips or reading an article from a magazine that’s two years old only stops you from doing what you’re supposed to be doing. Before you know it, you’re behind on your work and the stress kicks in. Keep your workspace clean and organized, removing everything that may cause a distraction. And this doesn’t just apply to your desk. Have a clean-up of your desktop too. All of those saved documents, downloads, games, and funny memes that you thought you might need at a later date, file them away out of sight. You can easily clean up your Mac desktop with an app like Declutter, which will intuitively organize your files in smart color-coded folders. After you see your desktop shining again, set up a new productive environment for the tasks awaiting you. An app like Workspaces would be of great help here, creating one-click solutions to bring up all the files, tools, utilities, and apps you need to complete your work. Finally, email. A cluttered inbox could well be the worst kind of clutter there is. It’s a time-waster and utterly disheartening to use, especially if you’re trying to find an old email. While the big email — Gmail, Outlook, iCloud, and Yahoo! — are getting better at organizing emails, none are on the level of Unibox. Unibox keeps everything beautifully organized in a way that actually makes using email enjoyable. Emails are grouped by sender, with each sender only listed once. Reading and writing is done in the same window and tracking down old messages can be accomplished in a couple of clicks. Plus, it works with all major providers. 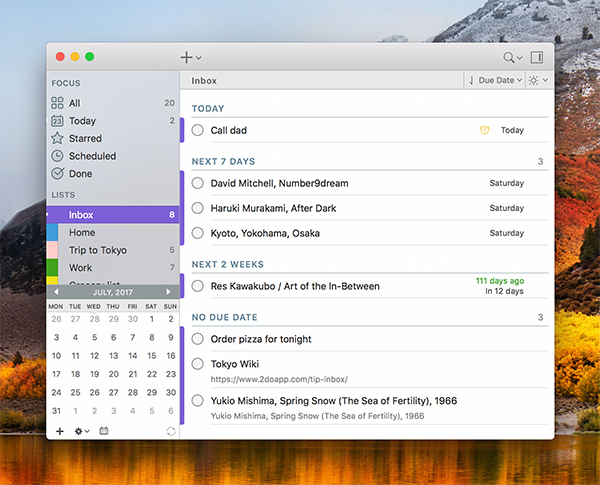 Unibox will prevent email distractions and make a massive difference to your productivity. Staying glued to the task at hand requires discipline. Potential procrastination inducers need to go. At the head of the list is, of course, social media. Facebook, Twitter, Instagram, YouTube and the rest are all great, but not for productivity. What sets out as a quick scroll through the feed turns into a three-hour wormhole that leaves you wondering where the time went. So first things first, turn off your phone. It’s a big step to take, but it needs to be done. It’s the only way to guarantee apps and push notifications won’t sucker you in. Remove the temptation of social media and other distracting websites on your computer too. Just closing the tabs won’t be enough — use an app like Focus to blacklist websites and applications for as long as you’re working. Goals give you something to work towards. And, as long as they’re realistic, will help you hit that deadline. Grab yourself a to-do app like 2Do or TaskPaper and list your priorities. Every time you’ve achieved a goal, check it off and reward yourself. The reward part is important as it will keep you motivated to see tasks through. A reward can be anything you want, from five minutes on social media to a bar of chocolate. Always be honest with yourself as to what you can accomplish on any given day. Structure and organization go hand-in-hand. A structured project means you know exactly what you’re doing and when. 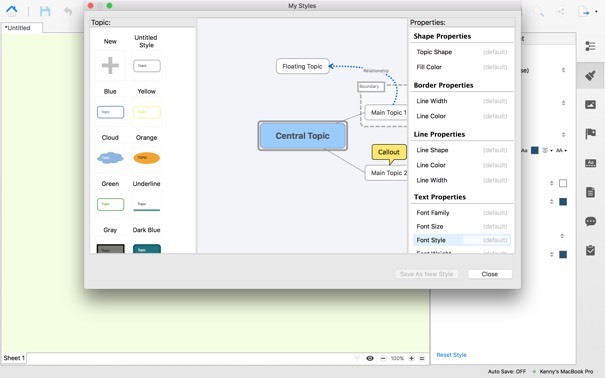 The structuring of your projects can begin at the idea stage with an app like XMind, which lets you brainstorm and create mind maps and then structure the data in a way that’s easy to understand. XMind allows to add numbers, images, charts, and documents to your mind maps, as well as timeframes and, crucially, deadlines. And it’s all done in a way that’s much more presentable than scribbles on a notepad. Moving on to the work stage, a visual timeline is the best way to stay on track for a couple of reasons: visuals are easier to remember, and a timeline puts everything you need in one place. 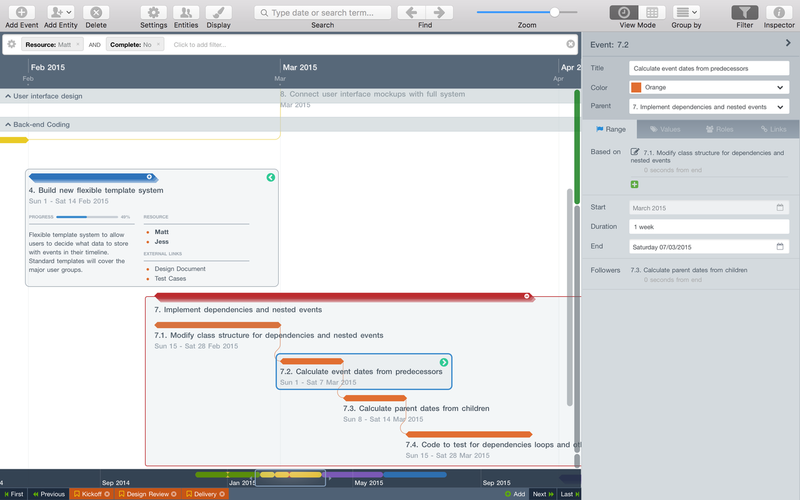 With an app like Aeon Timeline, you can add images, links, and task notes to timelines, and manage your project from a single screen. Having all of your research in one place stops you jumping between tabs and documents for information, saving time and keeping you engaged in your mission. Every day you can pick up from where you left off, each time getting a little closer to completion. Even with distractions minimized, goals in place and projects structured with military precision, there will be times when alertness dips and attention wanes. Research shows that the brain is only able to handle up to 45 minutes of information before it starts to decrease in its capacity to absorb anything. Because of that we’re encouraged to work in blocks with short breaks in between. The break supposedly allows the brain to recharge enough for us to go again. So rather than trying to push on through a marathon session before crashing and burning, it’s better to set timed intervals, using downtime to regain focus by taking a walk, listening to music, or grabbing a bite to eat. Maybe all three. The Pomodoro Technique is a method that suggests working for 25 minutes with 3–5 minute breaks. Of course, you might want to work longer and break for longer too (maybe maxing out at the 45 minutes). Set timed work intervals using the Focus app’s (the same one that lets you block distracting websites) built-in Pomodoro timer and adjust them until you find a pattern that suits you. With proper organization and help from some useful apps, it’s actually quite easy to stay on task and complete work on schedule. Who knows, from now on, you might even hand work in before the deadline. Hey, anything’s possible!